I graduated from the University of Wisconsin- Stevens Point in 1997 with a Bachelor’s Degree in Urban Forestry. I went on to work for a tree care company near the Twin Cities for several years before finding my home at Wachtel, near friends and family. I started out working on production crews to prune, remove, plant trees and other on-the-job tasks. 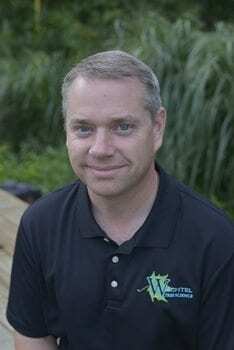 Since being with Wachtel, I have been a part of the Wisconsin Arborist Association serving in several capacities including being President of the organization in 2015. Now, as Vice President at Wachtel, I have been able to meet a lot of great clients and continue to assist the company where I can. When not at work, I continue to enjoy being outside bike riding, hiking, camping, fishing and hunting. I also spend my free time being involved in my son’s baseball league as well as my own church sponsored softball league. I am active in supporting the youth league to ensure that the sport is honored and enjoyed by the kids and their parents. My latest duties include being the active President of the organization and I enjoy meeting many baseball and softball players that appreciate the efforts to make their season a success. As a Board Certified Master Arborist, I approach tree care with the attitude that the homeowner will ultimately do what is best for them and their trees based on my recommendations. I will offer advice based on what I have learned and know about trees to provide the best options for them and their landscape. I appreciate having the opportunity to educate and assist clients in any way possible.